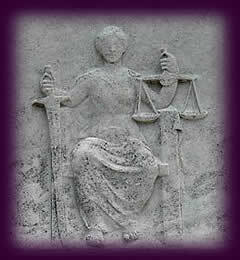 Themis was the second deity to provide the oracle at Delphi, the first being her mother, the earth goddess Gaea. The god Apollo would subsequently take possession of the shrine by slaying the Pythian serpent, a story that undoubtedly reflects historic changes to the local religious establishment. As everyone knows from personal experience, finding the ‘right’ way forward is not always as straightforward as following a code of ethics, and human beings have forever sought direction from the powers that they perceive as being greater and—hopefully—wiser. In antiquity certain places acquired a reputation for providing access to these powers. The temple at Delphi in ancient Greece was regarded as an omphalos, a ‘navel of the world’, and in the temple precinct there was a white stone bound with a red ribbon, supposedly marking the exact centre of the Earth. Just as a foetus is nourished in the womb through the umbilical cord, so did Gaea, the goddess of the earth, nourish her children through the words of her oracle†; in the illustration at left, it is Gaea’s daughter Themis who has inherited the power of the word. *Pindar (522–443 BCE), whose odes are packed with mythic reference, is considered to be one of the great lyric poets of ancient Greece. †Latin oraculum, from orare, to speak. 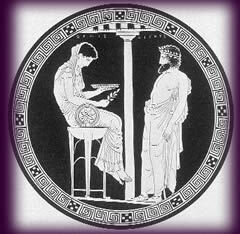 The story of Apollo’s appropriation of the Delphic oracle, and the myth of the birth—from Zeus’s head—of his daughter Athena (pictured below), seem an attempt to wrest wisdom from the lap of the goddess: in Hesiod’s ode to Zeus (right), it is now the god who possesses the ‘divine word’. Themis was one of the Titans, deities who predated Zeus and the rest of the Olympian gods. Theologies—like all ideas—do not remain fixed, but are reinterpreted by each generation, at times through a natural evolution, at others through forcible conquest. According to the Greek historian Herodotus (5th century BCE), in his time the oracles at Delphi were being delivered by Apollo’s priestess, named the Pythia after the serpent of wisdom whom Apollo is said to have slain. Seated on a tripod and speaking in a trance induced by natural gases seeping through the rocks, the Pythia would mutter the enigmatic oracles, which were then interpreted by the male priests—who effectively had the final say as regards the holy intent. To many women emerging from the shadow of men, the discovery of female deities has been a revelation and a liberation: at long last women have the chance to choose whose oracle they approach. However, whatever one’s beliefs, the gender of the divine power one decides to believe in is not as crucial as the psychological fact that an overly critical parent or culture can result in the internalisation of a ‘judge’—in both men and women—that can be crippling. In this case the positive attributes of ‘justice’—the clear sight and the ability to carefully weigh up alternatives—are in danger of being lost. in respect of the sinners on the final day of judgement. 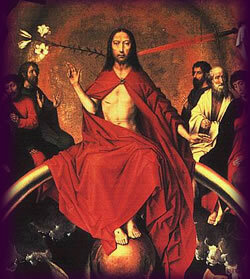 Another concept of divine justice familiar to many of us is the image of a heavenly god seated on a throne preparing to consign us to heaven or hell depending on our earthly performance, an image that—as witness from the quote above—has come down to Judaism, Christianity and Islam** from the earlier Zoroastrian religion. It also bears a relation to the judgement of Ma’at in the hall of two truths, however now the court is located in a ‘heaven above’ as compared to the Egyptian vision of an underworld realm (note the sword of justice on the right side of the figure of Christ). However perhaps equally well known is the representation associated with many modern day secular courts, that of Lady Justice (see below left), who in form and accoutrements descends directly from the classical goddesses. The balance that inevitably appears with these figures quite possibly originated from the ancient Egyptian image of the weighing of the heart. Yet the imagery remains apt, as scales are a potent symbol of the need to weigh up the alternatives before making a judgement—not only in the case of legal decisions, but in our own day-to-day choices. Justice’s sword, too, is a symbol with a multitude of meanings. Often perceived as an image of power, it can equally imply the ability to cut through a tangle of conflicting evidence to the ultimate core of truth. As in the bas-reliefs that appear on the lamp-posts in the plaza of the US Supreme court (left), Justice is often portrayed as blindfolded, said to represent the need for impartiality. Unfortunately, as noted in the Supreme Court’s own information sheet, it is generally accepted that when the blindfold first appeared, possibly in the 16th century, it was meant to indicate the establishment’s tolerance of abuses of the law: “to turn a blind eye” as the popular saying goes. 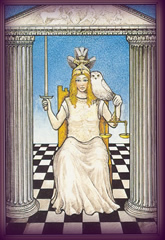 Whereas true justice requires the clarity of vision symbolised by both Zeus’ eagle and Athena’s sacred bird, the owl. *The Yasna is the main liturgy of the Zoroastrian religion; the oldest portion, known as the Gathas, contains hymns considered to be composed by the prophet Zarathustra himself. **There are references to a final judgement in the Qu’ran, but the Muslim prohibition against any figurative representation of Allah means that there are no images of such.